IAMPO R&T Certified NSF/ANSI 61 and NSF/ANSI 42 for structural integrity. With a UV disinfection system you no longer have to be concerned about waterborne pathogenic organisms causing illness. UV systems kill bacteria, viruses, and other pathogens by preventing them from reproducing. Pelican UV systems are for use on previously treated water as a supplemental treatment for protection against chlorine resistant bacteria including Cysts and Giardia. 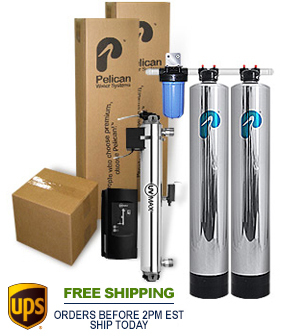 If you are interested in filtering chlorine and chemicals in your water as well as eliminating the negative effects of hard water without the use of salt then the low maintenance, easy-to-use Pelican Combo Series with UV is your answer. WQA Gold Seal Certification Body accepted "Salt Free Water Softener"
Pelican Water Systems provides the new standard in home filtration and salt free water softening products. Quality, innovation and proven performance are the reasons Pelican Water Systems are enjoyed by so many families across the world. With today's water supply becoming increasingly contaminated with each passing day, conservation of our fresh water supply has never been so important. It's time to see and feel the Pelican Difference for yourself! Viqua (A Trojan Technologies Company) has led the development of water treatment solutions using environmentally friendly ultraviolet (UV) light. Viqua has the largest installed base of UV systems in operation on the planet, and many of their innovations define the industry standards for safeguarding your water from the damaging effects of microbial and chemical contamination. Install a Viqua UV Pro disinfection system and you no longer have to be concerned about waterborne pathogenic organisms causing illness. Viqua UV Pro systems kill bacteria, viruses, and other pathogens by preventing them from reproducing. "My wife and I purchased the whole house water system in 2009. My neighbors all have water delivered to their homes, when they come to our home they are amazed that we drink the water directly from the sink. In addition, our hot tub is filled with the water and when we had it checked it was perfectly pure and clean. We have the system hooked up through the main line coming into the house so every drop of water runs through the system. We have never had any misgivings about getting the system. In addition, Pelican is always their to help with any questions." "All my research for a water purification system lead me to Pelican. I spoke to Patrick on the phone about a dozen times regarding questions about the system and pricing. He also spoke to my plumber twice. Patrick was very honest, helpful and did not pressure me into purchasing the system. I look forward to pure, clean water and no more lugging water bottles!!!" "First of all, allow me to compliment the Pelican Customer Service team for their outstanding services which I have received every time I've called upon them. We have the house salt free water softner/conditioner combo and have been using now for the last 2 years. What a big difference this unit has made in the way the water feels when taking a shower and drinking it too. 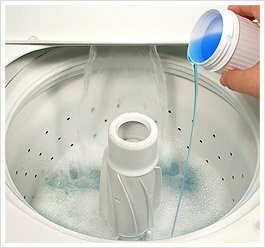 We would never again even think of using a salt water softener." PSE1800 Filter-Softener with UV For Wells 1-3 Bathrooms is rated 4.8 out of 5 by 45. Rated 5 out of 5 by Doyle Burrows from Some problems with install. Am amazed at clearness of water and taste. We have pressure issues, but had them previously. Wish we would have done it sooner. Had to replace some faucets that were previously calcium damaged. Prices were reasonable for what we got. Priced another company and Pelican was very nicely priced. No pressure salesmanship and products arrived timely and in good condition. Pelican employees were very helpful all during the install. Would do business with them if we ever can or need more products. Would recommend to anyone. I just don't know what I am going to do with all my spare time not having to scrub off the deposits of calcium. Thanks Pelican Company. Rated 5 out of 5 by Martina from Delicious Cristal Clear, Soft Water & Amazing... Delicious Cristal Clear, Soft Water & Amazing...Customer Service! We are VERY impressed of how noticeable the difference in water quality is after the installation of our PSE1800 Whole House Filter-Softener with UV 1-3 Bath! As well are we impressed of the company's customer service quality! We have had a communication problem which they've solved truly pleasant and elegant! The accumulated calcium on tiles and faucets is slowly but noticeably vanishing, it is rejuvenating our house! Our decision to get this PSE 1800 Whole House filter - Softener with UV 1 - 3 bath System installed, makes us happy and proud every single day! Thank you so very much to Pelican Water Systems! Rated 5 out of 5 by PleasedInGA from Results obvious immediately When I purchased the system, I was prepared to allow some time to elapse before the benefit became obvious. That was not necessary. Our water tasted better immediately. Further, during my first shower after installation was complete, I noticed a difference in how the soap and shampoo created suds. The water rinsed the suds away better as well. Over time we expect to see a reduction in hard water build up. Rated 5 out of 5 by Bobbi from Saltless Water Softener and Filtration with UV I am SO in love with my new saltless water softener and whole house water filtration with UV! At my last house I had everything but the UV, but I decided to splurge here and get the UV, and I feel so secure about the benefits, I am so glad I upgraded. I had planned all along to bring my tanks with me when I moved, but the new buyers wanted the system with the house which forced me to buy a new system. I'll never have a salt system again. Pelican is the simple THE best! Rated 5 out of 5 by slykennelguy from Very Happy I planned, researched and talk to plumbers for a few months before I decided to buy. I already had a salt softener in place but my family kept complaining about how the water tasted, so I broke down and ordered the works. I kept my current softener in place and added five more stages between it and the house. I now have no more complaints, and no longer worry about the boil water alerts we would get a couple times a year. Pelican water was great to deal with and had great communication with me. Rated 5 out of 5 by K. Sterling from Night and day difference in water I bought this system after our well tested positive for coliform bacteria. I sent Pelican my complete water test and they walked me through how this system would address each of the red flags on the report. It was relatively straightforward to install, and I had no existing plumbing experience. Between YouTube and several trips to Home Depot, I saved appx $1000 I would've paid out at least to hire someone. Our water feels much better in the shower, tastes better from the sink and our pressure seems to be up, as well as the dishwasher running smoother now that the calcification is starting to subside. Rated 5 out of 5 by Jacqueline from Can finally drink our well water. 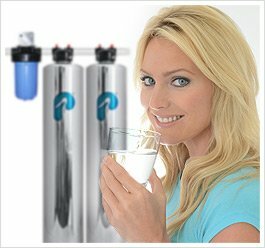 Our well repeatedly failed water testing for chloroforms; we have been buying bottled water for over a year for ourselves and our dogs. We got the UV / no salt / filter combo and our water test results came today; tonight we drink our water for the first time. We did not order the install kit at first; we realized we needed it after trying to find all the hook up components. The entire system takes up minimal basement space, and we chose the automatic delivery for filter replacements. So far we are very pleased. Thank you! Is this the whole house system good for drinking, shower, ice maker and appliance? Yes this system would protect your entire home from chemicals, hard water scale and bacteria. Does this system change the water pressure at the faucets ? Properly sized pressure drop at your faucets should not be noticeable (&lt; 15 pSI throughout the entire home). You will need roughly 35&quot; of width and 10&quot; off the wall to support this system. There are a total of 4 main parts to install: Sediment Filter, Water Filter, Water Softener and then UV. Does the UV light have a flow switch so that it's on only when water is flowing? UV must remain on to properly disinfect and ensure that water is always treated. What is the annual maintenance cost and procedures for a 3 bathroom house unit? You will change the UV lamp once a year, sediment filters twice a year, Carbon in 5 years. This size system will handle your size home. What is the lifetime of your standard dual tank system with a prefilter. The life span is 10+ years. You will replace the carbon media in 5 years and the Pre-filter should be changed every 6 months. Pelican Water Systems PC600/PC1000/PC1354 Systems are IAPMO Certified to NSF Standard 42 for the reduction of Chlorine up to 97% and NSF 61 for material safety. Chamber Dimensions: 22" x 4"
Chamber Dimensions: 31" x 4"
Q. Does the Pelican Combo Series pre-filter system remove COPEPODS from the water? Q. How easy is it to install the Pelican Combo Series Premium Whole House Water System? Q. 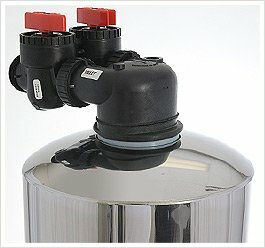 What is the blue housing installed before the system for? Every system Pelican offers comes with a 10" 5 micron sediment filter system. This sediment filter is used to keep sand and sediment away from your system and your home. You will change the filter every 6-9 months, depending on sediment levels. The pre-filter will let you know its time to change it when you notice a slight drop in water pressure meaning the filter is full. With all the new technologies being developed for water treatment, its important that your water treatment company help educate the consumer on new technologies and how they benefit you. The Gold Seal Body of the WQA agrees that Pelican's Natursoft system is a water softener and with third party testing showing 99.6% scale prevention, Pelican is the only salt free water softener with a proven track record on the market. Unlike other systems on the market, the NaturSoft systems requires only 3 seconds of contact with the water, while the others require 9 seconds or more. The Pelican NaturSoft is unlike any other system on the market. The NaturSoft is made in the USA and is sold only by Pelican Water Technologies. Q. Why does the NaturSoft handle 75 grains while others only handle 25 grains of hardness? The NaturSoft's catalytic granular surface is 100% active and grows seed crystals on the entire surface. Other similar technologies only have "growth sites" that are active, leaving more than 70% of the surface inactive. If the water is tested after the NaturSoft System is installed the hardness level will remain the same or even test slightly harder due to the existing scale being removed from the plumbing. Q. Do the NaturSoft Systems have any negative effects on the human body? No, if your water supply is safe before it enters the NaturSoft System it will be safe after the system. NaturSoft Systems do not add any chemicals to the water therefore there is no harmful effect. NaturSoft Systems leave in the beneficial minerals that are healthy for the human body. Q. How will the Combo System be shipped?